Don't let our dreams die in jail. This is what we live and fight for in here. We struggle for our dreams. When you are incarcerated you live day by day. We write to be heard, not ignored. Read what we have to say. All we have in here is a voice, but is it heard? Listen, listen, listen, We are speaking up for those who want to hear us. We want to tell you about our lives so you do not fear us. Maybe you can help your kids stay on the right path by reading the words of inmates. Only time will tell what is in store for us. We write because we want you to hear from us, stories from the lives we have lived. We are trying to change. Please don't count us out and leave us in the rain. To us time stands still. It does not move. Being incarcerated is a pain you cannot soothe. We just want you to listen. Albert Abonado's Flower City Yawp Interview with Dale Davis, Founder and Executive Director, NYSLC and readings by inmates in NYSLC's Community Engagement Seminar at Monroe Correctional Facility, February 2, 2017. NYSLC was one of the 1st upstate NY arts organizations to send writers into the public schools for 10-day teaching residencies on a regular basis. In the past 39 years, over 350 writers and artists worked with over 35,000 youth and adults in more than 600 different educational settings from rural, suburban, and urban schools, to alternative educational settings, to day treatment, to residential placement, to juvenile justice facilities, to jails and correctional facilities. The New York State Literary Center (NYSLC) -- a Rochester, New York area arts education organization -- provides transformative project based learning experiences that foster literacy development, community belonging, collaboration, and dialogue, for those incarcerated. Since 2005 the New York State Literary Center's focus has been on the arts integrated into incarcerated education in Monroe County. NYSLC's Incarcerated Education Program concentrates on adults incarcerated for a county year or under at Monroe Correctional Facility. This emphasis grew directly from NYSLC's history, experience, on going research, low literacy levels, recidivism, the disconnect from any sense of community, the consequences of incarceration for children whose parents are incarcerated, and the lack of information on the effectiveness of short-term arts programs in jails and correctional facilities. NYSLC's Incarcerated Education Program has three components: The Community Engagement Seminar, Rebuilding Families, and Theater. COMMUNITY ENGAGEMENT SEMINAR participants read, report, discuss, and write on history and issues they identify as important. Readings include poetry, history, identity, first person narratives, studies and research on children of incarcerated parents, the affects of parental incarceration on a child's education, poverty in Rochester, college and job-hunting with a criminal record. NYSLC identified the children of those incarcerated as a community need that was not being met. Rochester parents serving sentences of one year or under at Monroe Correctional Facility do not suffer the consequences alone; children often lose contact with their parents and many times visits are rare. Research has shown children of incarcerated parents are more likely to drop out of school, engage in delinquent behavior, and subsequently be incarcerated themselves. The separation of incarceration causes stress on relationships, emotional and mental strain and financial hardships that can leave a lasting impact on a child. 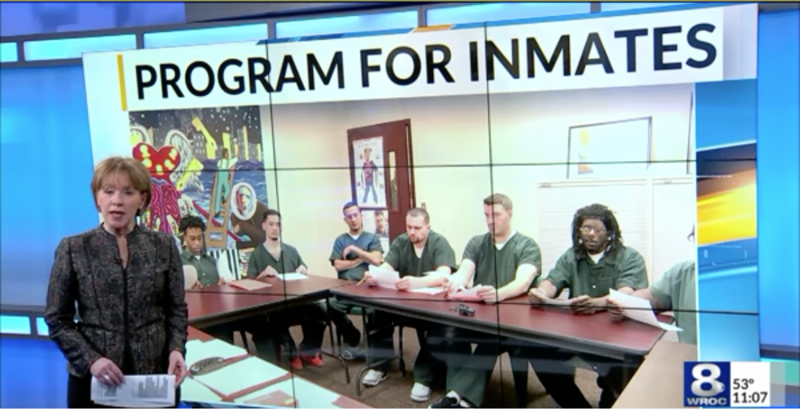 In 2014, NYSLC's Incarcerated Education Program partnered with the Rochester Broadway Theater League in REBUILDING FAMILIES, to rebuild and reaffirm the family for incarcerated parents and to reduce the impact of incarceration for their children. THEATER, adapted from the writing of those incarcerated with a strong historical component, has always been an important part of NYSLC's work, from the history of Rochester, to the voices of adolescents incarcerated as adults on their own "school to prison pipeline," "Where We Have Been: 1964," to "Reading James Baldwin 2015," performed at Monroe Correctional Facility in July 2015. The Community Engagement Seminar is a door that opened the consciousness of my mind to what is going on in our community. The Seminar gave me the freedom and opportunity to look at poverty and incarceration, not only to discuss these problems but also to write about solutions. The Community Engagement Seminar is a space for the voiceless. It shines a light on the darkness of incarceration and allows those who care to look to know there are strong and vibrant minds behind these bars. There are individuals who are trying sincerely to make a change in their lives and fight an uphill battle to become part of a society that has forgotten about them. The Community Engagement Seminar gives me hope that in spite of my circumstance I can succeed. By exposing me to the writings of and Langston Hughes and Frederick Douglass, I believe I, too, am America. Just as Douglass fought with his last breath for opportunity, so, too, shall I try. The Community Engagement Seminar is important. It is needed because it challenges us, it dares us to use our minds for something positive. It dares us to be lights in our community and to show that change is possible, not simply by uplifting our own lives but by giving a hand to our brothers and sisters. together we are searching for answers. Why does society hate some communities. as members of our community. The Community Engagement Seminar is a chance for me to express myself openly and honestly while I am incarcerated. Incarceration does not have much opportunity for this. There is so much judgment in here among the general population and the deputies that to have a platform for a creative outlet is invaluable to us. This helps us nurture free thoughts and creativity. This is also a way for us to stay in touch with current events and special topics. It is a way for us to connect with the outside world. Thank you. The Community Engagement Seminar is a place to address community needs, to connect with what is being done in Rochester’s Anti-Poverty initiative, special education in the Rochester City School district which so many of us in here were labeled and part of, Frederick Douglass, Kelsey’s Landing, as well as the effects on incarceration on children, our children. The Seminar has made me more self-aware and feel responsible and more accepting of self-change. I want to pass this gift of awareness to inspire and enlighten others and rekindle their spirits. To me the Community Engagement Seminar is an experience to let my mind wander out of these facility walls. The Seminar gives me insight to connect with what’s going on in my community.